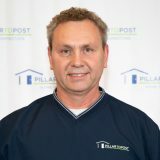 Since 2004, Pillar To Post has been your Sioux Falls home inspection company. Our home inspectors provide every client with a professional unbiased report with thorough details on the home’s current condition. Purchasing a home is one of the largest investments our clients will every make, and having a Pillar To Post home inspection gives them the confidence they need. Mark Reiff is your local home inspector. He has conducted over 1,000 inspections in Sioux Falls and surrounding areas. During your home inspection, Mark will cover 1,600 points, from foundation to roof both inside and outside the home. While performing your home inspection, Mark will encourage you to participate so that you can become familiar with the layout of the home, where all the major components are and ask any questions you have. Once the inspection in complete, he will email you the report, including photos, the same day. Mark’s flexible 7 days a week scheduling allows you to have an inspection at your convenience. Should you require any follow-up service, Mark encourages you to contact him with any questions you may have.